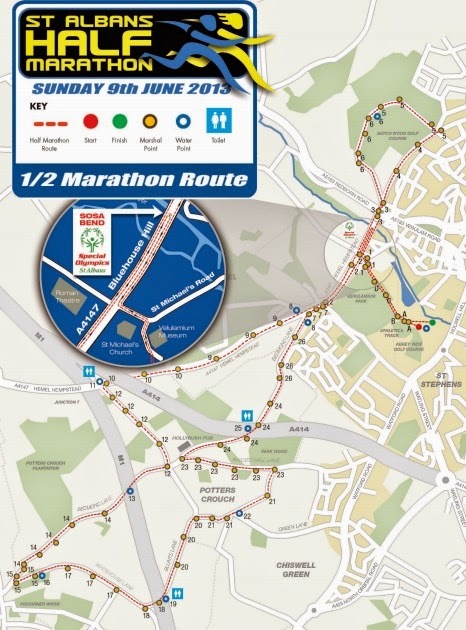 Those who know me will know that I spent much of last week psyching myself out about the St Albans half marathon. I had sore legs from the previous 6 weeks of racing and ropey guts and on top of that MP3 players were BANNED, not just advised against with the waiver that it is your own silly fault and liability if you get run over, this was BANNED and medals would not be awarded. Now, I ALWAYS run with music. I train to music. Of the 45 races I have completed in my 25 months of running, ALL have been thanks to delicately perfected playlists. I have a 10K playlist, I have a Half playlist, both crafted to allow for periods of cool down, of rest, and walking, naturally between bursts of speed. And so, if I went, it would be a weekend of firsts… The first time I had ever run without music. 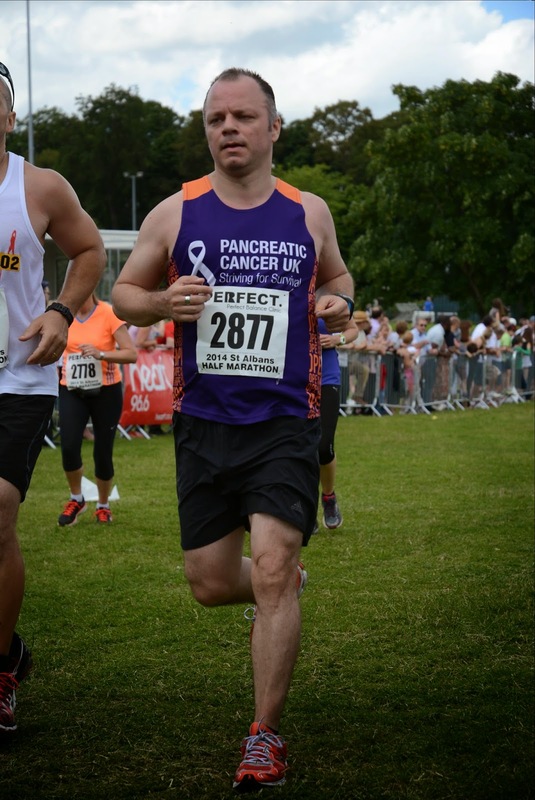 Continuing with the psyching out, I booked myself on the Wimbledon Summer Breeze 10K on the following Saturday to keep up the 20 Races for Pancreatic Cancer UK that I need to do in 6 months but then…. I went anyway. And I am glad I took the train and CityLink to St Albans as this huge and wonderfully supported and organised race had another first for me, a workmate, or former workmate, Jon Musker, who was raising money for charity himself. 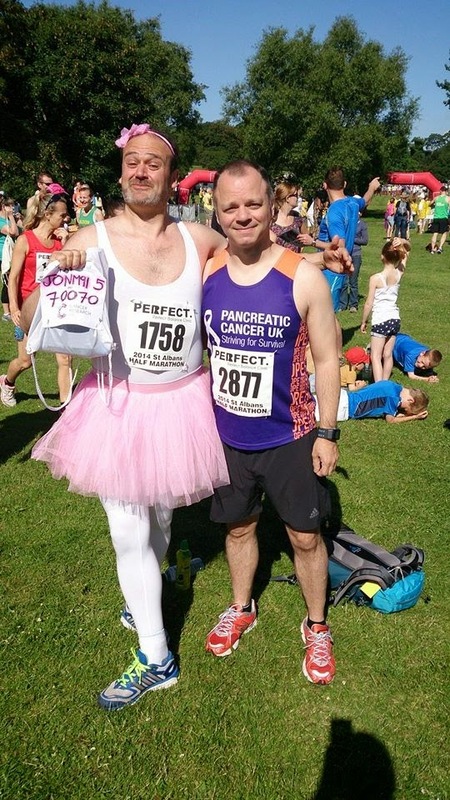 Seeing Jon put me a good mood, as he is a lovely guy, and he is running for a worthy cause. IT WAS HOT!!! Oh my it was baking. Hottest day of the year in my opinion. And it was to be the last outing of my orange New Balance, the ones that had allowed me to decide (by running the Luxembourg Night Half and this) that these were the shoe for me. New Balance 1080v2 9.5UK. A new pair is now prepared for the next race. 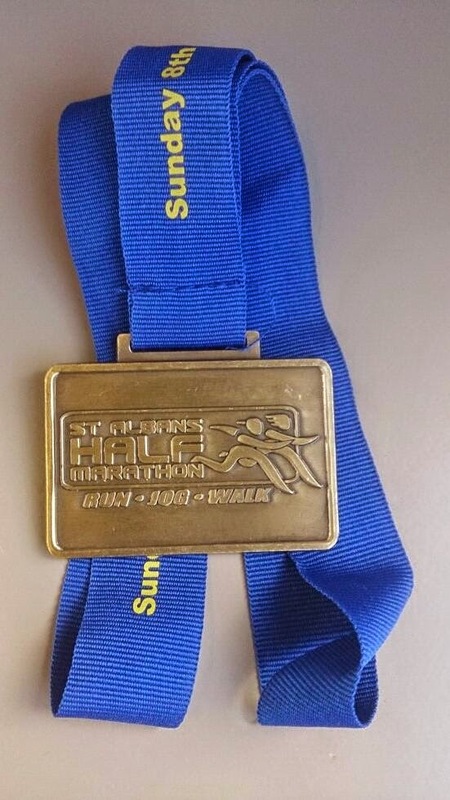 The route took you through the park (very reminiscent of Watford) but then went out of the city and into the winding, hilly country lanes that had the distinct feel of the Tunbridge Wells Half, albeit 80 degrees and not minus 5 in the wind. And, as I said, it was hot hot hot! And, with a race next week and the week after, I took it very seasy indeed and ran strong. The lolly we were all given at the end was so needed. And I was pretty sunburnt too. I spent the next couple of days looking like a Swan Vesta match. Also, drinking more water than normal made guts more ropey than before. 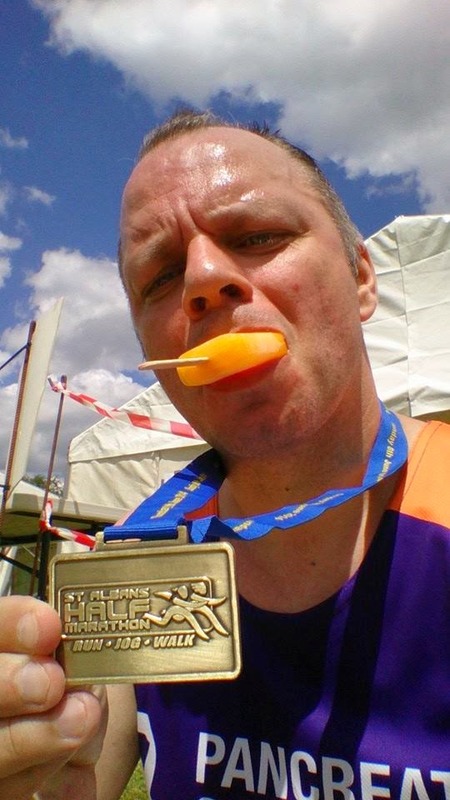 The SWAG was ok too, as mentioned there was a lovely orange mivvy (showing my age there) Ice lolly at the end with an average bling, bling that was the same for all events, the 5K, walk, or run, a t-shirt, and most exciting, a free quarter chicken voucher for Nandos. The photos came out very well for this race. SportsCam rather than MarathonFoto clearly do a better job. Here was my pick of the pics. Paid for and delivered within the hour. Excellent service. 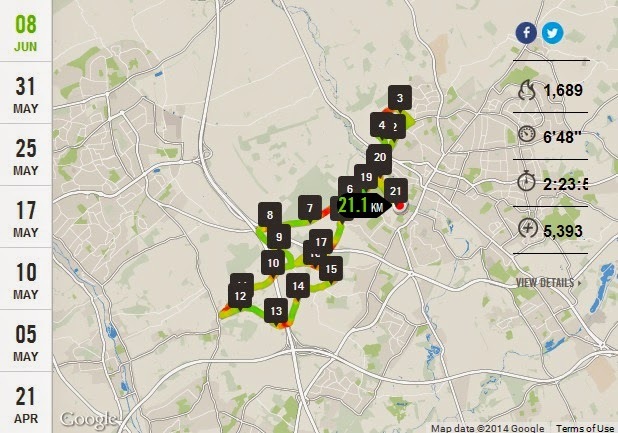 Did I enjoy the St Albans Half? YES! It was well organised, well supported, with a nice group, excellent facilities, average bling. Would I do it again? Probably not but I would recommend it. What did you like? Seeing Jon and proving to myself that I can run without music, it is just a case of mental strength as well as physical endurance. I did see a dozen or so people flaunting the no music rule. I also saw the marshalls doing nothing about it, which really disappointed me. I am not the music police, but I want all to obey the rules. I did see a guy after the finish being questioned and I would want to know if the organisers actually followed through with the disqualification ruling.